InPublishing has a revealing interview with Johnston Press’ new chief executive, a former technology boss with no newspaper experience. Ray Snoddy interviews Ashley Highfield, who was former head of technology at the BBC and later in charge of Microsoft’s online and consumer operations, on his plans for the newspaper group. It is worth reading the whole interview to find out why Highfield took up the challenge of joining the company, which seen its share price fall from 480p to 5p. The new Johnston chief executive also points out that while not a newspaperman, he has run two of the largest online news portals in the UK, MSN and BBC online, where he was editor-in-chief responsible for several hundred online journalists. Then of course there is the money, which included a welcome package of £500,000 worth of seriously deflated Johnston Press shares. If the new chief executive can conjure up a little alchemy, find a better model for linking the print and digital world and get the share price on the move then he could become seriously rich. Those however who expected Highfield to come in to Johnston Press and wave a magic digital wand on his first day at the beginning of November have already expressed disappointment. Highfield insists he has a digital strategy but says it would be “premature” to say in any detail how he is going to implement it. 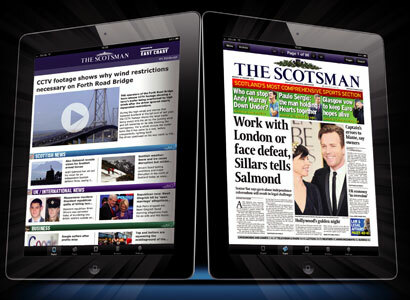 Highfield discusses content dissemination via iPads and other devices (incidentally, JP title the Scotsman launched a £7.99-a-month iPad edition earlier this week), but was less forthcoming about paywall plans (JP dismantled its trial walls in April 2010). And what about paywalls and charging for online content? “Watch this space”, is all Highfield will say but, clearly, increasing digital revenues is a central part of the emerging strategy. The full InPublishing interview is at this link. This entry was posted in Editors' pick, Newspapers and tagged Ashley Highfield, inpublishing, Johnston Press, ray snoddy on January 26, 2012 by Sarah Marshall. 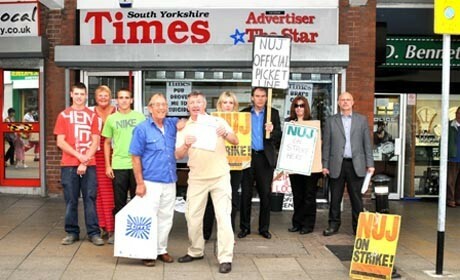 Johnston Press in South Yorkshire are out on indefinite strike over planned redundancies at five titles in the region. (See more from Journalism.co.uk about the strike action at this link). Management have come in for a lot of flak from the unions over their handling of the strike, which included asking a 16-year-old schoolboy on work experience to stay on an extra week and help cover the newsdesk. Further embarrassment for the company comes in the form of Tom Bills and friend Jack Reed. Tom – the son of Johnston Press managing director John Bills – and Jack were drafted in to help out on the newsdesk of the Doncaster Free Press, according to NUJ deputy organiser for the region Lawrence Shaw, despite having no journalistic experience. But rather than hide their faces away like strike breakers might normally do, ferried through a picket line on a bus with wire mesh on the windows, Tom and Jack publicised their newsroom antics on Facebook, for the world to see. Shaw spotted the Facebook status updates and reposted them on his blog. sooooo bored at work I’ve actually started look at the clock more than my computer screen. just thinkin of the dollar atm! As, I’m sure, are the journalists out on strike with no pay. nothing get a man erect like doncaster editorial. lets toss each other off. can u listen to ur ipod in a newsroom wen ur sposed to be workin? Why did he employ his own son and his friend to work in editorial when neither appear to have any journalistic training or experience, then allow them to sarcastically spout forth on facebook belittling the newspapers he runs? It reinforces the belief held by the NUJ that John Bills cares not a jot about the editorial coverage in the newspaper, or even the reputation of the papers. Had any ordinary NUJ member been caught mouthing off on facebook in the same way, they would have almost certainly been sacked for bringing the company into disrepute. So seeing as John Bills is ultimately responsible for employing his son to sit in the office and mouth off about how crap it is working at the Doncaster Free Press, surely Johnston Press directors should be seriously questioning his suitability for running a newspaper group. This entry was posted in Job losses, Newspapers, Press freedom and ethics and tagged Johnston Press, lawrence shaw, National Union of Journalists, nuj, south yorkshire strikes, strikes on August 5, 2011 by Joel Gunter. Johnston Press bosses in South Yorkshire, who reportedly asked a 16-year-old teenager to cover the news desk during a strike, have asked the work experience student to leave, the National Union of Journalists has claimed. 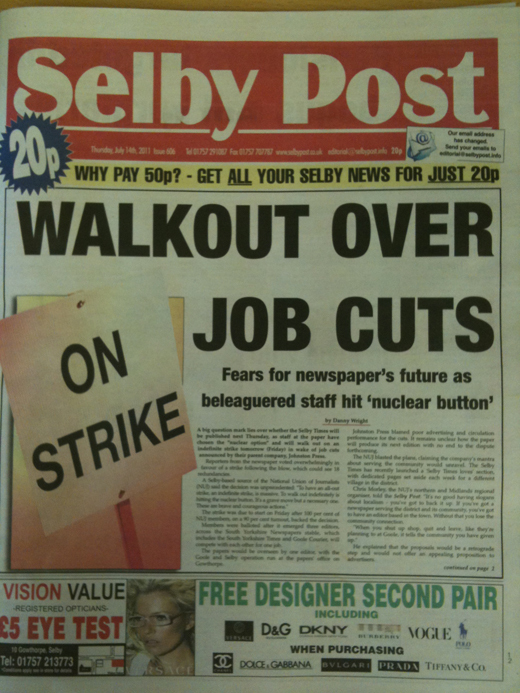 The teenager, who has just completed his GCSEs, had come to the group’s Selby Times for work experience but, when the strike to protect jobs and quality journalism began at the Selby Times, Doncaster Free Press and South Yorkshire Times on 15 July, management extended his engagement to get the paper out, the union has said. He was put to work writing news stories – despite having originally asked the paper to do his work experience on the sports desk, the NUJ said. Rival title the Selby Post reported the story. NUJ negotiator Lawrence Shaw told Journalism.co.uk he believes “embarrassed Johnston Press bosses” asked the work experience teenager to leave after the paper went to press on Wednesday. Around 25 members of staff are striking indefinitely, leaving the editor, sports editor and, at the beginning of the week the 16-year-old on work placement, Journalism.co.uk understands. “In more than 10 years of being a union representative I have never seen a more determined group,” Shaw said. Asked to confirm or deny the claims both the editor of the Selby Times and Johnston Press’ head office in Edinburgh declined to comment. This entry was posted in Job losses, Local media and tagged industrial action, Johnston Press, nuj, selby times on July 22, 2011 by Sarah Marshall. The National Union of Journalists has called on Johnston Press shareholders to encourage management to work with the union. In an open letter, published on its website, being presented to the publisher’s shareholder’s at an AGM today, the union criticises cuts at Johnston Press. The Johnston Press annual report boasts about ‘local content’, ‘teams of local experts’ and proclaims that ‘Content is King’. Yet behind the corporate jargon, the company has reduced staff in its editorial teams dramatically in the last 12 months, with so-called ‘back-office functions’ – which include newspaper content creators – being moved sometimes miles away from the communities they serve. 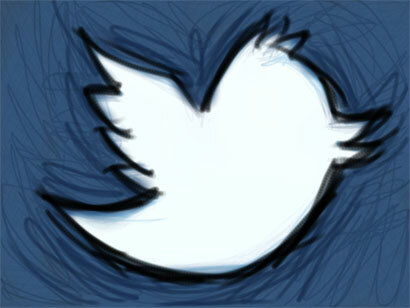 The much-hailed new content management system is ‘operational’ across the business. This is purely down to the hard work of journalists. The company’s failure to invest in new hardware made the shaky implementation of the system exceedingly difficult. Similar systems have been introduced successfully at other newspaper groups who recognised this was a key investment that couldn’t be brought in on the cheap. Over 230 editorial staff have been made redundant; significantly, 85 per cent volunteered to leave, a testament to the poor morale amongst staff. Those made compulsory redundant were often treated badly – in some cases individuals were given only a few hours to make a choice between a huge pay cut and imposed relocation or being forced to leave. All of this has taken place at a company that claims to belong to ‘Investors in People’. This entry was posted in Editors' pick, Local media, Newspapers and tagged cuts, Johnston Press, National Union of Journalists, regional publishers on April 28, 2011 by Rachel Bartlett. Johnston Press chief executive John Fry collected earnings of more than £1 million in 2010, according to the publisher’s annual report, sent out late on Friday afternoon. The report follows an announcement earlier this month alongside the company’s preliminary results that Fry was to step down within the next year. According to the figures Fry earned a basic salary of £525,000 in 2010, the same as the previous year, which was then boosted further by benefits and performance related bonus. This led to a total of £1,001,000, an increase on 2009 when Fry received a total of £969,000. The salary details of other directors were also detailed in the report, with chief financial officer Stuart Paterson, who resigned last year, receiving a total of £520,000 and Danny Cammiade, chief operating officer, receiving an increased total of £618,000. The report outlines the publisher’s financial performance in 2010, with key statistics including a decrease in total revenues of 7.1 per cent to £398.1 million, a drop in circulation revenues of 2.8 per cent to £96.7 million and an increase in digital revenues of 4 per cent. This entry was posted in Business, Editors' pick, Jobs and tagged financial, John Fry, Johnston Press, pay, revenues, salary on March 28, 2011 by Rachel Bartlett. Journalists at the Newsquest-owned Bolton News voted yesterday to strike in protest against an ongoing pay freeze. Twenty-one NUJ members took part in the ballot, with 16 voting in favour of strike action, the union said in a release. NUJ deputy general secretary Michelle Stanistreet said: “Newsquest and its American owners have been relentless in their pursuit of higher profits at the expense of journalists. Newsquest has suffered a series of strikes in recent months as a result of its ongoing pay freeze and relocation of production staff. The company brought the pay freeze to an end at the end of last year with a 2 per cent pay offer, but only for certain titles. In contrast, staff across titles in Wales, Gloucestershire, and the South Midlands were recently asked to take a week’s unpaid leave in order to help control costs. Meanwhile, NUJ members working for Johnston Press in Sheffield have called off planned strikes after reaching a deal with management over plans to cut production jobs at a centralised “editorial hub” in the city. The Sheffield hub produces pages for a range of Johnston Press titles in Sheffield, Doncaster, Chesterfield and North and Mid Derbyshire and South, West and North Yorkshire. This entry was posted in Job losses, Local media and tagged bolton news, industrial action, Johnston Press, National Union of Journalists, Newsquest on February 9, 2011 by Paul McNally. Interim management statements published this week by Johnston Press and Trinity Mirror suggest declines in advertising revenues appear to be slowing for both publishers. In a statement published today, Trinity Mirror said trading since the half year “has remained volatile due to the fragile economic environment and the uncertainty resulting from the Government spending review”. The Board envisages that the trading environment will remain challenging over the remainder of the year and into 2011, however, it anticipates that the rate of decline in revenues will improve. The group recorded declines in ‘adjusted’ advertising revenue of 4.6 per cent year-on-year (excluding the acquisition of GMG Regional Media), but overall the company recorded actual advertising growth of 13 per cent in the 17 week period (including the acquisition). It added that full ownership of Fish4 will boost its digital recruitment ad revenues by £3 million in the first full year. This report followed Johnston Press’s statement yesterday which reported a decline in total advertising revenue for the second half of the year to date of 5.4 per cent (year-on-year). This represents an improvement on the first half decline of 6.3 per cent, the report adds. The decline in print advertising revenues excluding recruitment in the second half to date is 2.5 per cent, with the decline in recruitment advertising in the same period being 29.1 per cent. In order to reduce costs the publisher announced it would be closing its printing operation in Limerick. A spokesperson told Journalism.co.uk this would impact on 29 part-time workers. This entry was posted in Advertising, Business, Editors' pick and tagged Advertising, Johnston Press, revenues, Trinity Mirror on November 11, 2010 by Rachel Bartlett. A curious strategy by Johnston Press’ chief executive John Fry, who has reportedly written to the BBC Trust asking the body to limit the number of news stories the BBC’s website publishes online to three per city or region. This entry was posted in Editors' pick, Local media and tagged John Fry, Johnston Press, Local media, Local newspapers on October 15, 2010 by Laura Oliver.